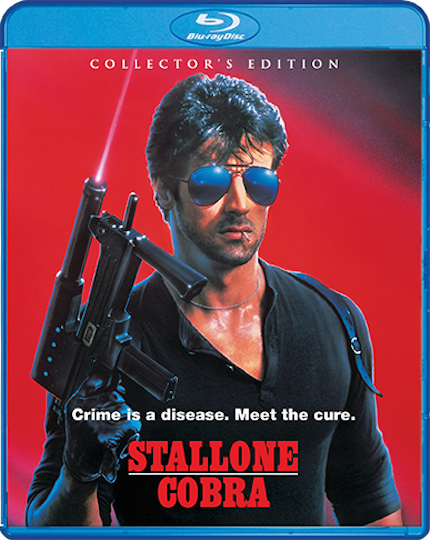 Cobra, the 1986 cop movie that endorsed lethal force, starred Sylvester Stallone, the biggest box office draw in the world at the time. So it's even more surprising to realize that it was produced by Menaham Golan and Yoram Globus of Cannon Films. Cobra was directed by the late George P. Cosmatos (Tombstone, Leviathan, Rambo: First Blood, Part II). But if you know Cannon's filmography, then watch Cobra, you'll understand exactly how the film fits into, well, Cannon's canon. Stallone plays a stock character within Cannon's ouevre of 'man who wouldn't take it anymore' films, or in this case, a man who probably never took it, and deals out his own murdery blend of justice. This lieutenant is eager to send the bad guys straight to hell rather than draw out the criminal court process. Sadly, when Cobra was completed and submitted to the MPAA, it was given the dreaded X rating, which is the death knell of any film looking to acquire a large audience. And so, Stallone and the powers that be cut the hell out of the film. An old TV version of the movie had some of the deleted scenes put back in, but the rare workprint of the film apparently has tons of footage of gore and violence excised, which I'd love to see. I'm sure it would make the film more coherent. There are times when the film, for lack of better cinematic language, devolves into a simple music video or montages of action and explosions, or all three. Again, here is where all of those cuts weakened the storytelling. That's not to say that Cobra isn't fun; there are plenty of hilarious moments and quirks to be found. Stallone chews a matchstick for the whole movie and I was pleased -- but not surprised -- that this pays off at the end when he finally uses it. But his character "Cobra," short for Marion Cobretti, does things like cut his cold pizza with a pair of scissors before eating it -- with his leather gloves still on. Come on, man. You've ripped other men's shirts open, ridden motorcycles, thrown knives, and gotten in gnarly fights wearing those gloves. I bet those things are filthy. The picture itself on this release ranges from okay to good. There's some flickering here and there, especially in the beginning, but genrally, the images benefit from the new 2K scan. Sound is fine. Now if only someone could find and release that ultra-violent workprint! The interviews on this collector's edition sport some hilarious quips and memories, including Thompson's recollections of Cosmatos and how he wasn't invited to the film's Hollywood premiere. I haven't been able to listen yet to the old commentary of the film with Cosmatos himself, but I do hear that it's hilarious, so check that out. When it comes down to it, Cobra is big, dumb '80s action movie fun, even if it is flawed. The Blu-ray is out now from Scream Factory/Shout! Factory; you can watch the fun, totally '80s trailer and order the disc here.